Contest: Win a 2019 Can-am Outlander ATV valued $14,099. 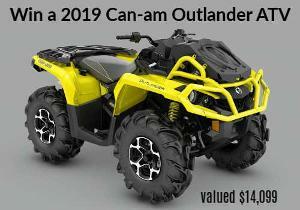 Win a 2019 Can-am Outlander ATV valued $14,099. Prize: There will be one (1) Grand Prize (the “Prize”) available to be won consisting of a 2019 Can-am Outlander ATV (model#: X mr 850). Statistics: This contest was opened by 184 and entered by 30 ContestChest.com members. 16% of those who opened the contest, entered it.